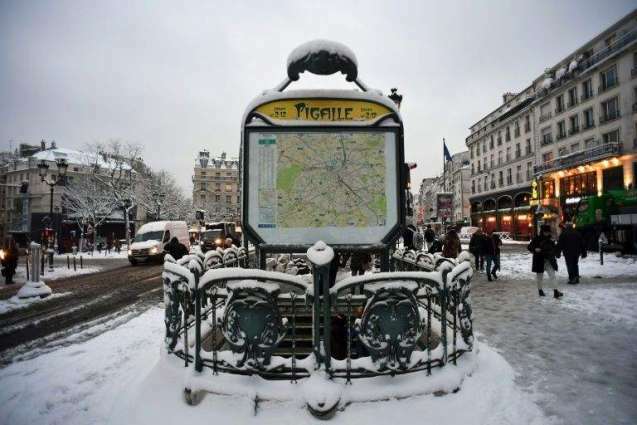 PARIS: Exceptionally heavy snowfall brought public transport in Paris and surrounding regions to a near halt Wednesday, spelling misery for commuters after hundreds were forced to abandon their cars to sleep in emergency shelters overnight. Icy streets were largely empty as officials urged people to leave vehicles at home following the 12 centimetres (almost five inches) of snow that blanketed the capital, shutting down some tram and commuter rail lines, and almost completely halting bus services. Officials had opened 46 shelters in the greater Paris region for more than 600 people stranded by the snow, while about 700 had to spend the night at the Montparnasse and Austerlitz train stations in Paris. Some 230 people were had to sleep as best they could at Orly airport. Operations were still disrupted at Orly and Paris’s Charles de Gaulle airport Wednesday, with some flights facing delays while other travellers remained stuck. At Charles de Gaulle airport, officials announced over loudspeakers that all suburban train connections to Paris had been cancelled for at least several hours. A dozen perplexed passengers waited outside a railway ticket office at one terminal. “I tried to get into Paris by train. I was sitting on a train for half an hour and then everyone got up and left,” said Paul Farberman, a 66-year-old music industry executive who had just flown in from Los Angeles. Evacuations were still under way for the 1,500 to 2,000 people stranded on a highway south of Paris, prompting anger from drivers who said the route should have been closed to traffic sooner. One driver, Antonio De Lemos, told AFP he had been “stuck in the snow since 5 pm” and spent the night in his car. “It’s a natural event, but it’s not normal because they leave all the roads blocked, without salting them” to remove the ice, he said. Forecasts for even lower temperatures are likely to freeze the heavy snow in place, making conditions even more treacherous, the Meteo France weather service said. “We’re dealing with an exceptional situation,” interior ministry spokesman Frederic de Lanouvelle told AFP, urging people “not to use their vehicles”. Some 25 departments across much of the northern half of France were on alert for snow and black ice, and more snow is expected to hit the country from Friday. Paris police also urged people to leave their cars at home in order to avoid traffic jams and facilitate the work of rescue services and tow trucks. Police had also closed major highways near Paris to lorries, and rail operator SNCF told clients to postpone their trips if possible. Slobodan, a 46-year-old sales representative, said he had spent the night “going from cafe to cafe” near the Gare du Nord station in Paris after his train was cancelled Tuesday night. He had been hoping to make it home early Wednesday “to take a shower, change clothes and get back to work at La Defense,” the business district west of the capital. But “all trains toward the suburbs have been cancelled since 5:00 am,” he told AFP. In addition, school buses were not running in several areas near Paris and other northern and central regions.